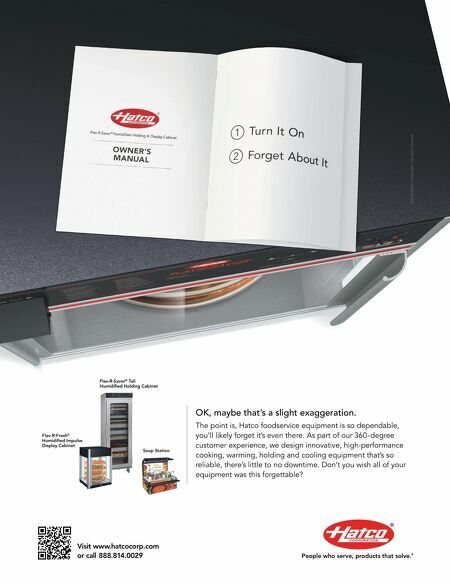 86 • FOODSERVICE EQUIPMENT & SUPPLIES • OCTOBER 2018 market spotlight Kum & Go. "With our 'Marketplace' store format, intro- duced in 2016, we've begun to include a selection of made- to-order and limited-time-offer sandwiches." The increased focus on food included ramping up limited time offers, which Boulden says allows for more creativity and signature items. Last year the chain's Chicken & Waffles sandwich LTO became a top seller. Other popular items include seasonal salads, breakfast sandwiches and breakfast burritos. 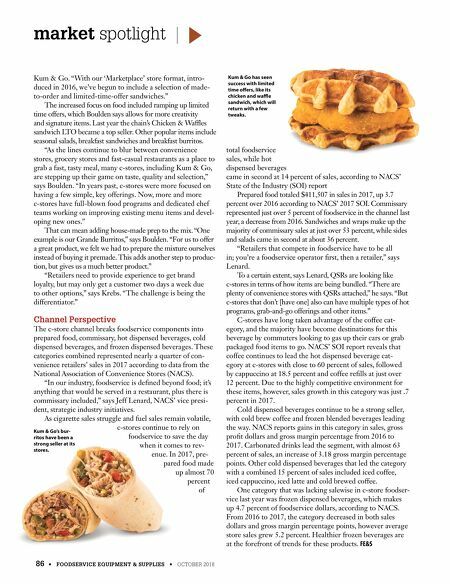 "As the lines continue to blur between convenience stores, grocery stores and fast-casual restaurants as a place to grab a fast, tasty meal, many c-stores, including Kum & Go, are stepping up their game on taste, quality and selection," says Boulden. "In years past, c-stores were more focused on having a few simple, key offerings. Now, more and more c-stores have full-blown food programs and dedicated chef teams working on improving existing menu items and devel- oping new ones." That can mean adding house-made prep to the mix. "One example is our Grande Burritos," says Boulden. "For us to offer a great product, we felt we had to prepare the mixture ourselves instead of buying it premade. This adds another step to produc- tion, but gives us a much better product." "Retailers need to provide experience to get brand loyalty, but may only get a customer two days a week due to other options," says Krebs. "The challenge is being the differentiator." Channel Perspective The c-store channel breaks foodservice components into prepared food, commissary, hot dispensed beverages, cold dispensed beverages, and frozen dispensed beverages. These categories combined represented nearly a quarter of con- venience retailers' sales in 2017 according to data from the National Association of Convenience Stores (NACS). "In our industry, foodservice is defined beyond food; it's anything that would be served in a restaurant, plus there is commissary included," says Jeff Lenard, NACS' vice presi- dent, strategic industry initiatives. As cigarette sales struggle and fuel sales remain volatile, c-stores continue to rely on foodservice to save the day when it comes to rev- enue. In 2017, pre- pared food made up almost 70 percent of total foodservice sales, while hot dispensed beverages came in second at 14 percent of sales, according to NACS' State of the Industry (SOI) report Prepared food totaled $411,507 in sales in 2017, up 3.7 percent over 2016 according to NACS' 2017 SOI. Commissary represented just over 5 percent of foodservice in the channel last year, a decrease from 2016. Sandwiches and wraps make up the majority of commissary sales at just over 53 percent, while sides and salads came in second at about 36 percent. "Retailers that compete in foodservice have to be all in; you're a foodservice operator first, then a retailer," says Lenard. To a certain extent, says Lenard, QSRs are looking like c-stores in terms of how items are being bundled. "There are plenty of convenience stores with QSRs attached," he says. "But c-stores that don't [have one] also can have multiple types of hot programs, grab-and-go offerings and other items." C-stores have long taken advantage of the coffee cat- egory, and the majority have become destinations for this beverage by commuters looking to gas up their cars or grab packaged food items to go. NACS' SOI report reveals that coffee continues to lead the hot dispensed beverage cat- egory at c-stores with close to 60 percent of sales, followed by cappuccino at 18.5 percent and coffee refills at just over 12 percent. Due to the highly competitive environment for these items, however, sales growth in this category was just .7 percent in 2017. Cold dispensed beverages continue to be a strong seller, with cold brew coffee and frozen blended beverages leading the way. NACS reports gains in this category in sales, gross profit dollars and gross margin percentage from 2016 to 2017. Carbonated drinks lead the segment, with almost 63 percent of sales, an increase of 3.18 gross margin percentage points. Other cold dispensed beverages that led the category with a combined 15 percent of sales included iced coffee, iced cappuccino, iced latte and cold brewed coffee. One category that was lacking salewise in c-store foodser- vice last year was frozen dispensed beverages, which makes up 4.7 percent of foodservice dollars, according to NACS. From 2016 to 2017, the category decreased in both sales dollars and gross margin percentage points, however average store sales grew 5.2 percent. Healthier frozen beverages are at the forefront of trends for these products. FE&S Kum & Go's bur- ritos have been a strong seller at its stores. Kum & Go has seen success with limited time offers, like its chicken and waffle sandwich, which will return with a few tweaks.